This fantastic reverse painted cocktail tray is probably from the 1930's, and is 8-1/4" deep and 13-3/4" long with the applied handles. 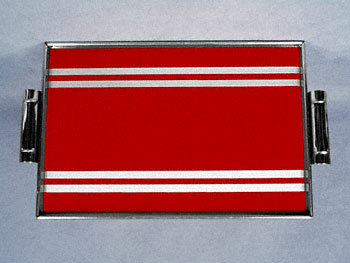 It has a glass insert, covering a base of deep red and two pair of silver stripes. The chrome is in very good condition, with no pitting or rust, and the red and silver paint are nearly flawless. This tray is in excellent condition, with only slight scratching of the glass, and would be a great addition to any art deco bar.